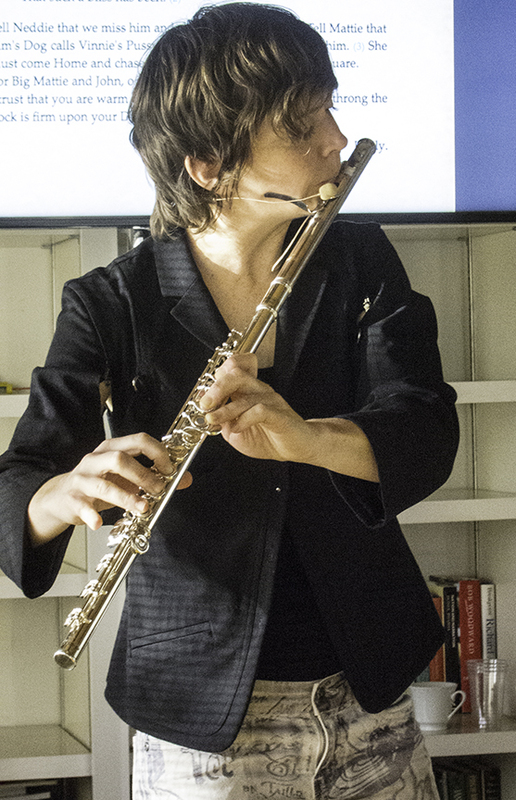 However, Claire is much more than a consummate flutist, arts entrepreneur, and the founder of the International Contemporary Ensemble (ICE). She also is a performance artist. By this, I don’t mean simply a musician who stands on stage and performs music, whether improvised or composed. Instead, I mean that Claire Chase uses stage and venue in highly creative ways to fill an entire space not only with music and sounds but with her bodily presence. 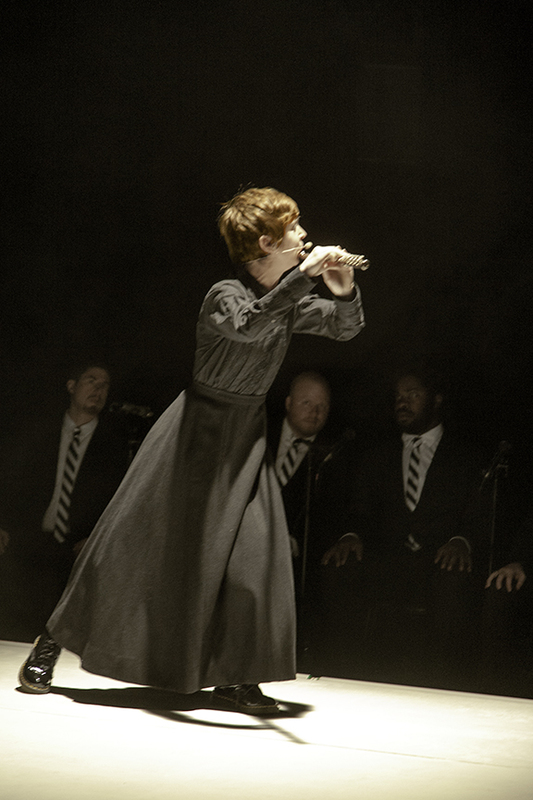 To properly accomplish this, she often physically transforms the stage and almost always uses lighting in unusually dramatic ways. I suspect that most of us associate the term performance art with the work (often scandalous) of some of our more radical visual artists–the Happenings of Allan Kaprow or Claes Oldenburg, for example, or the slightly later work by artists like Nam June Paik, Vito Acconci or Chris Burden. Yet, the early history of performance art enjoys a strong musical connection, first with Italian Futurism and soon more widely with the Dadaists. Several decades later, starting in 1948 at Black Mountain College, John Cage and Merce Cunningham initiated music-based performance art which blurred the boundaries of art and life while experimenting with new technologies. 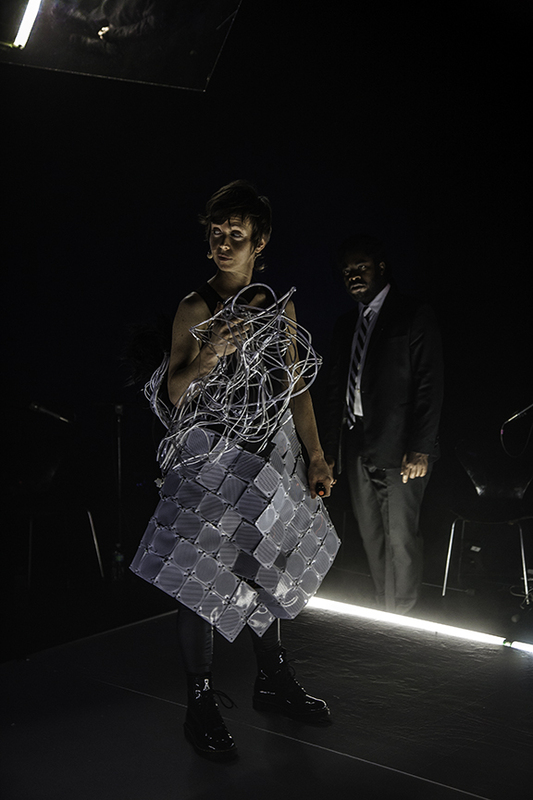 I see the work of Cage, in particular, as a distant progenitor for Density 2036: part iv, the performance by Claire Chase and her artistic collaborators which I have documented in the following photographs. Nothing is fixed for Chase. She moves everywhere, her movements carefully choreographed. We will see that, in one instance, she even lies down and plays from a supine position. More broadly, Density 2036 in its entirety is John Cage-like, because it is an on-going project that won’t “end” for another twenty years. Thus, Claire Chase embraces John Cage’s promotion of the creation of art divorced from any idea of how it will end. Both of these artists privilege the process of creation over the idea of a finished product. My soundless, still photographs, inadequate as they may be, provide a small glimpse of Claire Chase and her musical collaborators as they performed the six compositions of the fourth Density 2036 on December 1, 2016 at The Kitchen in Chelsea, Manhattan. This photograph, along with the next six, document the beginning of the evening’s program in which Claire performs the work of six composers. 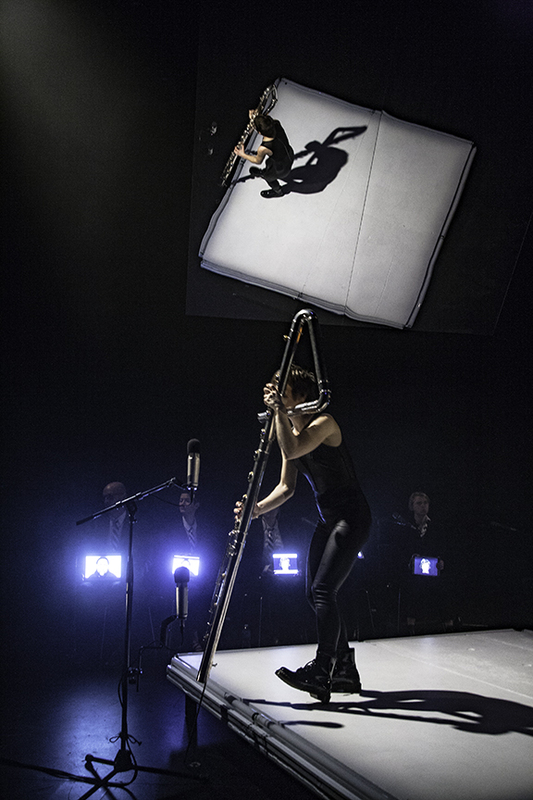 I use this photo to illustrate the unusual staging: a raised, square platform with lighting around its edge and, hanging above and behind it, an angled mirror in which performer and stage is reflected. The dimly-lit people seated behind the stage in a semi-circle are members of the vocal group, Roomful of Teeth. This first piece, Density 21.5 by Edgard Varèse, is the only piece not commissioned by Chase. It also is the basis and inspiration for all that follows as well as for her future performances of Density 2036. I refer you to Alison Kinney’s article in the Village Voice, which does a wonderful job of creating context for this event. 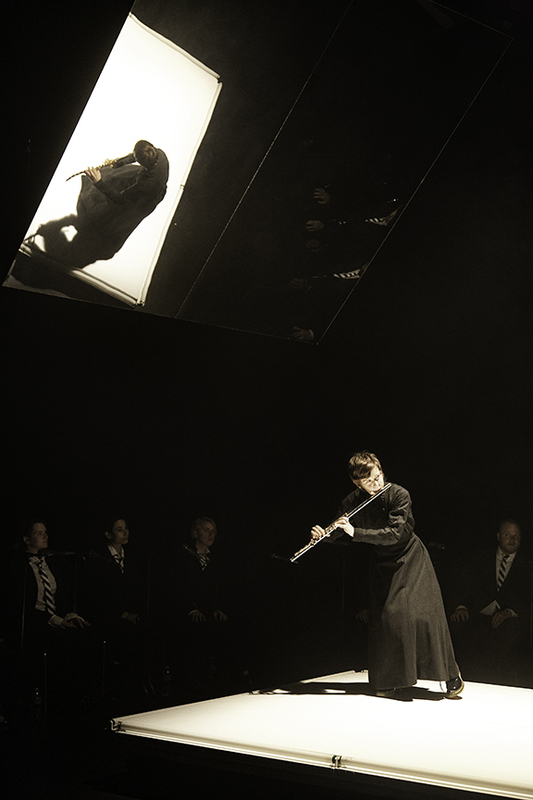 Although Claire is alone on stage as she plays Varèse, her movement for this performance has been choreographed by the Swiss artist, Julie Beauvais. These seven photographs document the collaboration between Chase and composer Suzanne Farrin, who is playing the ondes martenot. 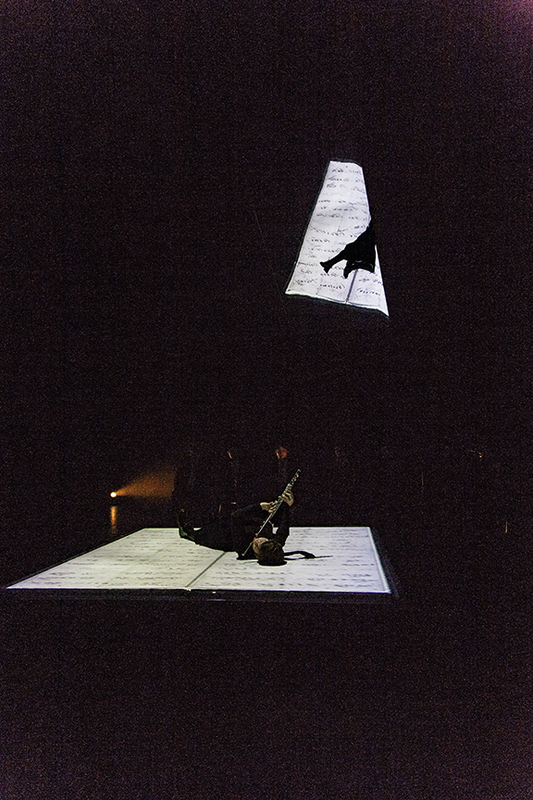 Claire’s movements for this piece and the four others to follow were directed by the Berlin-based American artist, Lydia Steier. To miss you, Sue, is power. 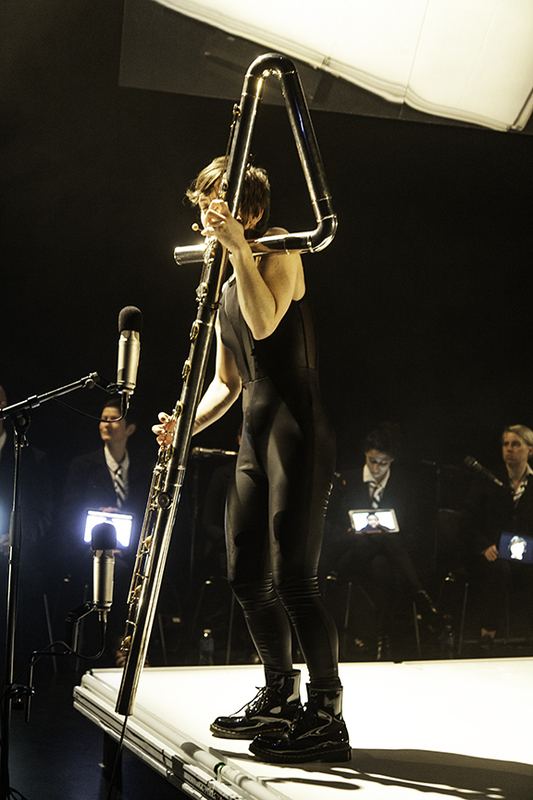 Bertha refers to Claire Chase’s contrabass flute, “Big Bertha.” Here she stands on the left edge of the stage, facing Tyshawn Sorey who is seated behind his drum set. My apologies for not getting a good photograph of Tyshawn; I leave it to you to imagine the dialogue across space between him and Claire. This is a percussive piece, not only because of the drums, but also because of the large keys of the flute; the opening and closing of Bertha’s keys is audible. It is also electronically amplified to make Bertha into another percussion instrument. I should note that the entire concert was dedicated to Oliveros. As the program states: Density 2036 part iv (2016) is dedicated to the loving memory of Pauline Oliveros (1932-2016). These three photographs document the ritualized dressing of Claire Chase in a speaker dress designed by Pauchi Sasaki. However, while this activity is taking place, a tape of Vijay Iyer’s Flute Goals fills the auditorium. Vijay Iyer, who also is a MacArthur Fellow (2013), composed his electronic piece from five sound files that Claire Chase improvised and then sent to him. This is another mode of collaborative creation that Chase constantly seeks, and I am tempted to view Iyer’s piece as a modern, more controlled version of the Surrealist concept of the exquisite corpse. Once the Iyer piece ended, Claire descended from the raised stage and began a slow, measured walk. Flute-less at first, she made sounds from blowing in (or over?) the bundle of tubes that can be seen in the third of the above photographs (as well as in two of the three photographs of her ritualized dressing). Soon, from behind the audience on the right, Pauchi Sasaki entered with a similar, measured walk. She, too, was wearing a speaker dress. She generated her sounds through a headset microphone. 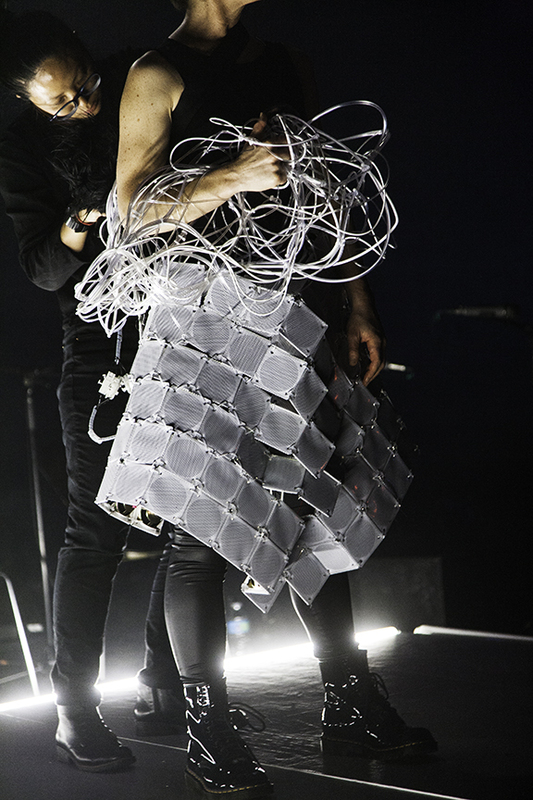 All sound was emanating from the bodies of the two performers, or, more specifically from the 100 speakers of Sasaki’s dress and the 125 speakers of Chase’s dress. As Sasaki explains, the dresses are “self-contained systems” with their own stereo amplifiers and batteries. After the two performers came together, they crossed paths and continued in different directions to the edges of the room. 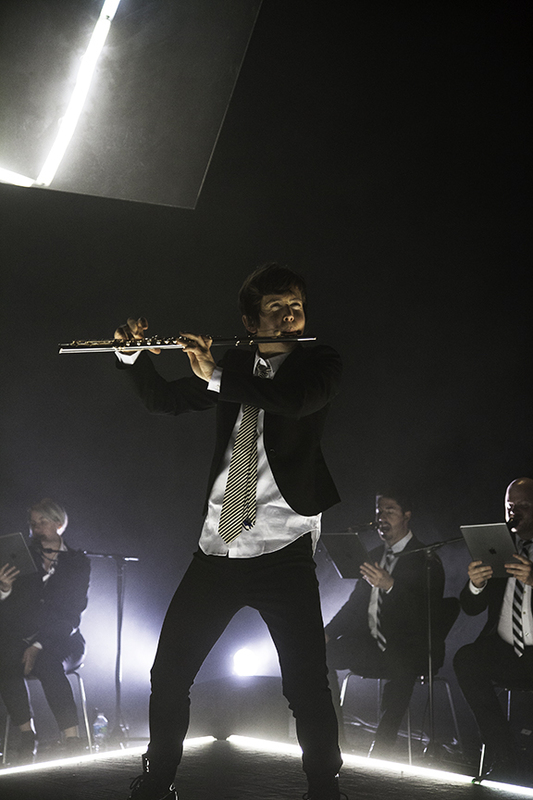 Soon, they re-emerged playing their instruments: Sasaki a violin, Chase an alto flute. Sasaki is Peruvian, but of Japanese descent, and her multicultural background may have contributed to an interesting aside: Some sixty years earlier, a Japanese member of the avant-garde Gutai group, Atsuko Tanaka had designed an Electric Dress which lit up in colored lightbulbs. One might see that dress as the ancestor to Sasaki’s more elegant and functional Speaker Dresses. 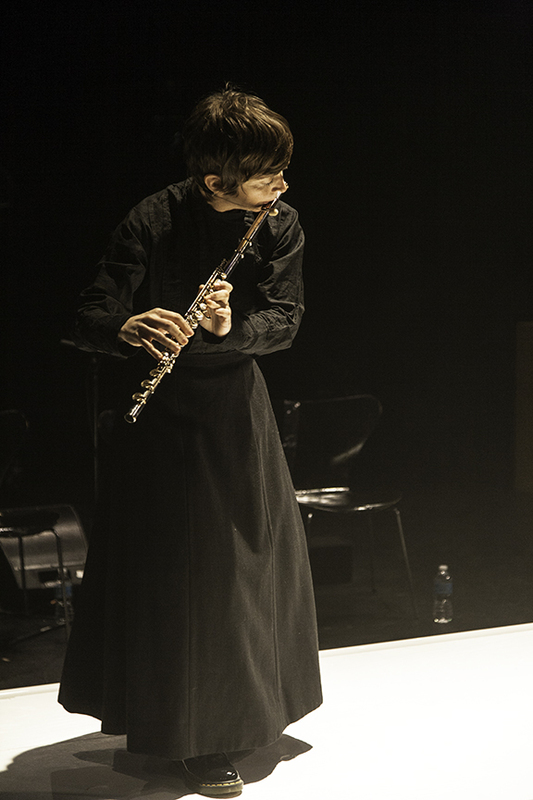 Beaudoin’s Another Woman of Another Kind is subtitled “seven stories for flute and eight voices on texts by Paul Griffiths.” It’s creation involves another mode of collaboration between Claire Chase and the composer. Chase began by making a recording of Varese’s Density 21.5. She sent this recording (made at the Meyer Sound studio in Berkeley) to Beaudoin. He used a technology called microtiming to slow it down to milliseconds, from which he then selected aspects–including the noise of the keys and the sounds of her inhalation–and transcribed these into a new composition. In essence, this is an interesting form of the art of appropriation–a term usually applied to the visual arts–in which an artist borrows imagery from the work of another artist and recontextualizes it into a new work. What’s interesting about this particular appropriation is that it originates as an agreed collaboration between the two artists. Finally, among the other collaborators for Density 2036: part iv are sound engineer Levy Lorenzo, lighting designer Nick Houfek, and the conductor/founder of Roomful of Teeth, Brad Wells.